As the growing season winds down, some growers will be considering a broadcast planting of cereal rye seed over unharvested crops to establish an early cover. Consider scouting for slugs prior to broadcasting the cereal rye. 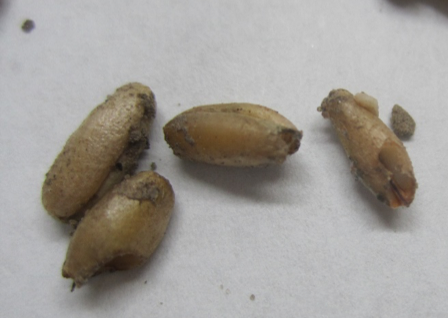 Slugs can severely reduce stands by feeding on the seed prior to germination. The cool and wet conditions we had in most of Wisconsin during 2017 has been conducive to slugs. Slug feeding on cereal rye seed. To avoid surprises, scout fields prior to broadcasting seed. Slug damage can be found under many field scenarios including low residue conventional tillage systems. However, the potential for slug damage is usually higher when weed pressure is high, fields remain wet for prolonged periods of time or have heavy soils as well as no-till or any other management system which leaves high amounts of surface residue. Slugs are nocturnal feeders and difficult to monitor during daytime hours. Looking for old or current damage on the standing crops may provide limited information. Instead, take advantage of a slug’s habit of needing to hide during the day. Consider placing a large flat object on the soil surface that slugs can crawl under during daylight hours. Sections of scrap lumber or old singles (with the mineral side up) are ideal. Cardboard may also work if it doesn’t get blown or washed away. However, direct contact with the soil surface is important. Monitor these structures for several days during daylight hours. There are no established economic thresholds using this method and effectiveness may vary according to competing habitat. However, their use will confirm the presence/absence of slugs. If slugs are present and you feel there is a concern based on field history, consider drilling the cereal rye after harvest. Drilling buries the seed out of reach of slugs and will significantly reduce economic damage to seed.